Today we'll examine the team's depth on defense. The Eagles are loaded at defensive end. • Brandon Graham has become one of the best all around defensive ends in the NFL, as he is equally disruptive against the pass and the run. • Derek Barnett had a very good rookie season, and history has shown that pass rushers tend to experience big jumps in productivity in their second season in the league. • Michael Bennett was added via trade, upgrading on the departed Vinny Curry. • Chris Long returns after high production as a role player in 2017. • Steven Means was often a victim of a numbers crunch last season, and he'll have to scratch and claw for a roster spot again in 2018. • The team added an intriguing athletic specimen in Josh Sweat in the fourth round of the draft. The success of the Eagles' defense is predicated on the front four being able to generate pressure on the quarterback without the benefit of blitzes. The Eagles can send pass rushers in waves, which keeps them fresh as offensive linemen tire over the course of games and seasons. If/whenever Timmy Jernigan fully recovers from back surgery, the Eagles will have a great trio of defensive tackles in Fletcher Cox, Haloti Ngata, and Jernigan. They also have a few defensive ends in Graham and Bennett who like to slide inside and rush the passer against opposing offensive guards who are ill-equipped to handle their quickness. Until Jernigan is healthy, however, the Eagles' defensive tackle rotation will be a little thin. The primary backup is currently Destiny Vaeao, a player who the Eagles had inactive down the stretch last season, and doesn't offer any obvious plus traits. To be determined if second year pro Elijah Qualls can become a quality reserve capable of giving Cox and Ngata the occasion series off. It's noteworthy that the Eagles reportedly worked out some defensive tackles soon after the draft. On May 22, the Eagles released Mychal Kendricks and lost free agent addition Paul Worrilow for the season with a torn ACL. Unquestionably, the Eagles depth at linebacker took a hit that day. The release of Kendricks was an obvious decision, as he was set to count for $7.6 million against the salary cap this season. By releasing him, the team saved $4.4 million. The rest of the league agreed that Kendricks' value wasn't high, as Kendricks, perhaps unwillingly, signed a meager one-year deal with Cleveland worth "up to" $3.5 million. The Eagles have a potentially great pair of starting linebackers in Jordan Hicks and Nigel Bradham, provided Hicks can recover fully from a ruptured Achilles, his latest major setback among a long list of career injuries going back to college. He'll also have to, you know, not seriously injure some other major ligament this season. The top three candidates to win the "third linebacker" spot, a spot I personally consider the 15th most important position within the Eagles' defense, are Corey Nelson, Kamu Grugier-Hill, and Nate Gerry. Nelson played well in a dominant Broncos defense in a similar role in 2016, before his season was cut short in 2017. His specialty is in coverage, which is what the Eagles prioritize in their linebackers. Similarly, Grugier-Hill and Gerry were both safeties in college, and bring coverage ability to the table, but their effectiveness overall in the regular defense is mostly projection at this point. And then there's Joe Walker, who is still on the roster, and recently signed LaRoy Reynolds, who has mostly been a special teams guy in the NFL. Should Hicks or Bradham go down, Nelson would probably be the top candidate to step into one of the two main linebacker roles. 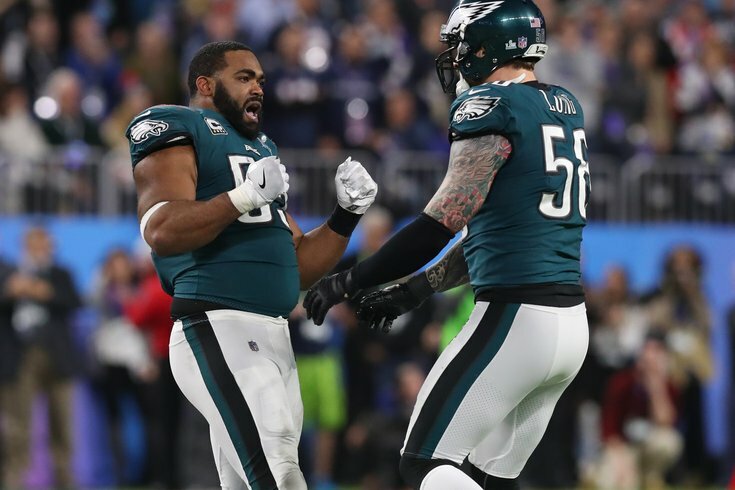 Guys like Grugier-Hill and Gerry offer solid potential, but I could certainly see the Eagles continuing to look for ways to add more experience to the unit before the season begins. The Eagles' top 5 corners – Jalen Mills, Ronald Darby, Sidney Jones, Rasul Douglas, and Avonte Maddox, all playing on their rookie contracts – will count for a combined $4,495,873 against the salary cap in 2018. There are 39 individual CBs who will make more on their own. Add in spring standout De'Vante Bausby, and the Eagles are paying their top six corners $5,050,873 this season. Oh, and none of them are over the age of 25. There's perhaps some worry that none of the Eagles' corners have much experience at the pro level playing in the slot, and it will be interesting to see if/how Jim Schwartz utilizes more of a matchup-based system with his corners, but overall, the Eagles have impressive young depth at corner. It's remarkable that the Eagles were trotting out Leodis McKelvin and Nolan Carroll two seasons ago. Malcolm Jenkins is, in my view, a top five safety in the NFL, and Rodney McLeod is a solid starter. Beyond them, the Eagles have Chris Maragos and a handful of guys with no NFL experience. Actual reporting: Corey Graham says he does want to play again. Will let agent handle any contract stuff. Doesn’t rule out return to Eagles. Sooooooo... I don't know. Fill in the Judge Smails "Well, we're waiting" gif here, I guess.